The KRG is calling for immediate, direct assistance to minimize a humanitarian catastrophe as a result of a lack of proper shelter and medical care for civilians fleeing Mosul. The KRG has not only supported and hosted fleeing IDPs, but also provided leadership in planning humanitarian response and advocacy for resource mobilization. The purpose of this message is to alert the international community of an impending humanitarian catastrophe and to request additional resources to be provided immediately to deal with the increased burden. The Kurdistan Regional Government (KRG) is struggling to absorb and care for tens of thousands of Mosul residents fleeing the ongoing operations to liberate the city from ISIS terrorists, in addition to the 1.8 million people who had previously fled. The dramatic increase in the volume of critically injured people has flooded Kurdistan Region’s hospitals, and is overwhelming the Region’s already strained healthcare sector. Conducting adequate security screenings for incoming internally displaced persons (IDPs), as well as maintaining internal security for cleared IDPs, is a responsibility that is growing rapidly in size and complexity and will soon surpass the KRG’s technical and personnel capacities. Since the start of the operations on 17 October 2016, as of 28 January 2017, over 195,000 individuals have fled Mosul city and its periphery. The KRG’s latest data show that more than 96,000 individuals of these recently displaced people have arrived and are being cared for in Erbil and Duhok. As military planning and preparations are underway to launch the offensive to liberate the west side of the Mosul city, it is estimated that half a million people are still living in ISIS-controlled Mosul and it is anticipated that the majority of them will flee and need the lifesaving assistance. Even, the eastern side liberated, displacement is still ongoing and on daily basis people are arriving KRI due to the dire humanitarian and security situations. 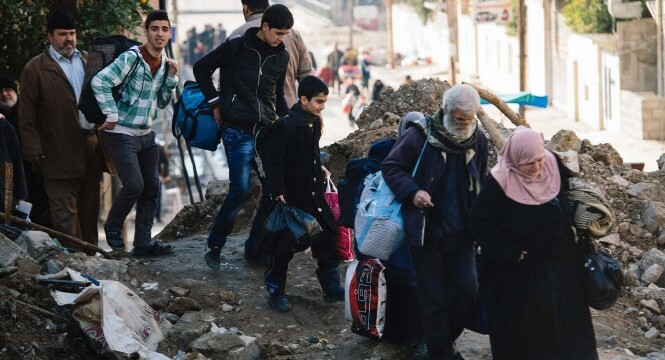 The Kurdistan Region today hosts more than 1.8 million; 97% Syrian refugees and 40% internally displaced Iraqis, as a result of the war in Syria, the genocide by ISIS, and the ongoing operations to liberate territory from the terror group. The displaced have arrived in Kurdistan Region destitute and often with both physical and emotional wounds. Prior to the Mosul operation, hospitals throughout the Region were flooded with refugees and IDPs, who treat those in need without discrimination and at no cost to the individual. KRG Peshmerga troops have liberated tens of thousands of square kilometers from ISIS, including strategic towns and roads which laid the groundwork for the Mosul offensive. These gains were made at great expense, with 1,600 Peshmerga killed and nearly 10,000 seriously wounded. At the same time, a financial crisis has crippled the region, resulting from the cost of the war and humanitarian crisis, the crash in oil prices, and the federal government’s unconstitutional decision to withhold Kurdistan’s share of Iraq’s federal budget. As a result, KRG employees, who make up the bulk of the work force, have experienced delays in their salaries and cuts to benefits and pensions. This has had a profound, negative effect on frontline Peshmerga soldiers and civil servants involved in assisting the humanitarian crisis. Additionally, the unemployment rate has increased by threefold from 3% in 2013 to 14% in 2016. Kurdistan Region’s hospitals are already unable to provide sufficient care for the influx of injured Iraqi Security Forces and Peshmerga, as well as thousands of civilian IDP casualties. There are simply not enough intensive care units, recovery beds, and medical supplies to absorb all cases. Since the military operations on 17 October 2016, over (10340) injured civilians have been transferred to the hospitals in Kurdistan Region; (2340 Duhok governorate and 8000 Erbil governorate). This is apart from the huge number of wounded Iraqi soldiers and peshmarga forces. Without immediate international assistance to build the capacity of Kurdistan’s medical care, we could be heading towards a catastrophe. The difficulty in caring for the influx is compounded by an ongoing financial crisis and the insufficient medical supplies being sent by the federal government. The financial crisis has left the KRG struggling to pay salaries of public servants, which is having a negative effect on medical professionals in the region. Qualified medical personnel are unable to work long hours required to support massive influxes of IDPs. With the support from the Iraqi Ministry of Migration and Displaced (MoDM) and UNHCR, the KRG has constructed 5 emergency camps for new arrivals from Mosul in Duhok and Erbil. The finished emergency camps are already fully occupied and accommodated over 26,000 families, 96,000 individuals; with support from the MoDM and partners, five additional emergency camps are being finished to create more space for the continuous flow of IDPs from Mosul. KRI can only receive around 10,000 more of displaced families, once all camps finished. Even, the eastern side of Mosul city liberated, displacement continues due to the dire humanitarian and security situation, daily over 1000 individuals are fleeing and more than half resorting to KRI. Without international support, hundreds of thousands of IDPs will sleep rough through the cold winter months and beyond, causing inconceivable suffering and loss of lives. Furthermore, despite having prepared a Joint Humanitarian Contingency Plan in June 2016 for Ninewa and constant calls for support to Baghdad, UN agencies, and donors, the KRG has not received any direct financial support to care for Mosul’s injured. Today the KRG covers all operational, administrative, protection and security costs of the camps and reception centres, totaling more than 3.5 million USD monthly. The KRG has been providing several essential services to IDPs; continuing to provide support at the current level requires direct financial and technical assistance from international partners. In cooperation with the Government of Iraq and humanitarian partners, the KRG upholds the humanitarian principles of impartiality in protection and continues to support the well-being of displaced people, including providing safe passage to civilians fleeing the battlefield to reach safe areas. Peshmerga troops have liberated thousands of square kilometers from ISIS, and have secured, cleared, and repopulated dozens of villages in Nineveh. Recent IDP arrivals from Mosul have lived under ISIS rule for more than two years, and our assessments suggest ISIS is attempting to infiltrate Kurdistan through them. Consequently, arriving IDPs must be properly screened before they are permitted to enter displacement camps in Kurdistan. This task is complex and time-consuming, and as IDP influxes increase, KRG security services are concerned that it will overwhelm their capacity. In addition, ISIS’ campaign of genocide in Iraq shattered trust among local communities, particularly between the numerous ethnic and religious groups who lost their homes to the terror group. As a result, the potential for a conflagration of retaliatory and revenge attacks between groups is very high. Preventing this is our priority but it needs international assistance. Since the start of violence in Syria began displacing people to Kurdistan, the KRG has been on the front lines of sheltering and caring for displaced people. Today, Kurdistan hosts more than 1.8 million displaced Iraqis and Syrians, representing a 32% increase in the region’s population. The operations to liberate Mosul have displaced (195,000) people and this number is increasing daily. The responsibility to care for them is shared by the KRG, the GoI, and the international community. The KRG has not only supported and hosted fleeing IDPs, but also provided leadership in planning humanitarian response and advocacy for resource mobilization. The purpose of this message is to alert the international community of an impending humanitarian catastrophe and to request additional resources to be provided immediately to deal with the increased burden. I call upon all partners, the Iraqi government and all donor countries and members of the International Coalition to act with urgency in providing funds and material and technical assistance directly to the KRG to mitigate risks and minimize human suffering. Urgent financial support is critical for KRG institutions to respond effectively and efficiently to the massive humanitarian emergency that continues to unfold. “Since the “Free Mosul” operations started on the 17th of October 2016, KRG and its various institutions have played a lead role in receiving and providing life-saving assistance and shelter to the civilians that have fled the war zones and ISIS-controlled territories to seek refuge in the Kurdistan Region of Iraq. Since the start of the operations, our region has received more than 95,000 people and all of them are cared for. As two-third of Mosul city has been liberated and we are confidently eliminating the presence of ISIS, it is our priority to ensure the safe, voluntary and dignified return of the displaced populations to their homes. KRG holds a clear and consistent position that return must take place under safe, voluntary and dignified conditions for the displaced populations. We will work hard to ensure a successful and transparent return process with the best interest of the civilian population in mind. In respect with International Humanitarian Law and in order to guarantee the safe, voluntary and principled return of displaced populations, the KRG does not have any intention whatsoever to close the camps where the displaced populations are hosted. Such measures would be in stark contrast to our policy. However, we very much welcome the return of IDPs to their places of origin and we will continue to do everything in our power to support and facilitate their voluntary return upon their free choice. KRG opened its doors for the displaced civilians since the invasion of ISIS in June 2014. For all those families that resorted to the KRI, we have provided security, protection and services without discrimination based on ethnicity, religious background, color or political affiliations for almost 1.8 million IDPs and refugees. Our policy has been consistent throughout this humanitarian crisis and we will maintain this policy as it is in line with our vision for a safe return of people to their homes. Since the beginning of the second phase of Mosul operation, three thousand people have been displaced per day, in which 70 percent have taken refuge in the Kurdistan Region. Second phase of Mosul operation started on 29 December 2016, provoking displacement of a large number of people. “Due to the battle inside Mosul city, the number of wounded civilians have increased. So far, three thousand wounded people have received treatment in Erbil and Duhok hospitals. However, due to lack of direct required support from the Iraqi Federal Government and the international community, the assistance provided to those people are insufficient compared to the required needs,” JCC Director General added. 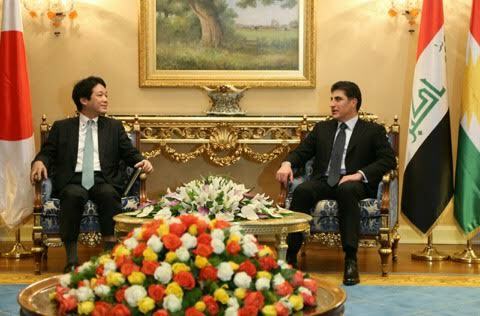 Kurdistan Regional Government Prime Minister Nechirvan Barzani met with Japanese State Minister for Foreign Affairs Kentaro Sonoura and his accompanying delegation. In the meeting, attended by Deputy Prime Minister Qubad Talabani, the Japanese Minister reaffirmed his country’s position to further strengthen its relations with the Kurdistan Region, by opening its consulate in Erbil on Wednesday. Prime Minister Barzani expressed his appreciation to the people and government of Japan for their continued support to the Kurdistan Region Government, including Tokyo’s insistence on guaranteeing Kurdistan Region’s share in the loans lent to Iraq. Japanese loans have financed a number of strategic projects across the Kurdistan Region. Mr. Barzani also commended Japan for opening its consulate in Erbil, stating his government’s support to the Japanese diplomatic mission in Kurdistan. Erbil, Kurdistan region, Iraq (cabinet.gov.krd) – Kurdistan regional Government Prime Minister, Nechirvan Barzani met with Turkish Prime Minister, Binali Yildirm and his accompanying delegation, comprising of a number of ministers and senior officials. At the meeting, attended by KRG Deputy Prime Minister, Qubad Talabani and a number of ministers and senior officials, the visiting delegation stressed the continuation of consultation meetings between Turkey and Iraq in general and Turkey and the Kurdistan Region in particular. The delegation pointed to issues of mutual interests, including the fight against the Islamic State terrorist organization, and the stability and security of Kurdistan Region and Turkey. The delegation also discussed the ongoing military operation to liberate the city of Mosul, expressing their concern regarding the presence of forces of Turkey’s Kurdistan Workers Party in Sinjar region. The two sides also agreed that bilateral relations, in all the fields, should be further developed. Prime Minister Barzani expressed his appreciation for the humanitarian support that Turkey provided to the Kurdistan Region. He expressed his hope to further develop bilateral relations. Discussing KRG’s current reform campaign, Prime Minister Barzani noted that Turkey can provide expertise to the health sector in Kurdistan Region. Resuming the works of a joint committee, established to support boosting bilateral relations, and further development of cooperation in the field of energy were also discussed in the meeting. Turkish Prime Minister arrived in Erbil, the capital of Kurdistan Region, in the early hours of Sunday. After holding talks with the Kurdistan Region President Massoud Barzani and KRG senior officials, he concluded his visit Sunday night. The Kurdistan Regional Government Spokesperson hails French President’s “historic” visit to the Kurdistan Region, as President François Hollande became the first foreign head of state to visit Kurdistan twice during his tenure. Minister Safeen Dizayee said that President Hollande’s visit underlines France’s continuous support to the Kurdistan Region, especially in the fight against the so-called Islamic State terror group. He said that the Kurdistan Regional Government highly values France’s military, diplomatic and humanitarian support to the Kurdistan Region. The French leader arrived in Erbil, capital of the Kurdistan Region, on Monday and met with leaders of the Region. In an official ceremony, the Kurdistan Region President, Prime Minister and other senior officials greeted French President upon his arrival at Erbil International airport. Later, President Massoud Barzani and President Hollande visited the front lines of the war against ISIS to meet Kurdish military forces, the Peshmergas, and observed the gains made in the fight against terror. During a press conference back in Erbil, French President said that without the sacrifice and heroism of the Peshmergas, the defeat of ISIS was impossible. President Hollande also praised the Kurdistan Region for sheltering a large number of refugees and internally displaced persons, and protecting various ethnic and religious groups. French Minister of Defense, Jean-Yves Le Drian and a number of senior military and public officials accompanied President Hollande in his visit to Erbil. The French leader first visited Kurdistan in September of 2014, when ISIS terrorists were attacking different parts of Kurdistan. The Council of Ministers of Kurdistan Regional Government condemned terrorist attacks across the Iraqi cities of Baghdad and Najaf, and the New Year’s Eve attack in Istanbul, Turkey. In a statement released on Sunday, the Council of Ministers said these attacks show that terrorists are defeated in the battlefields of Mosul and other areas in Iraq and Syria, therefore they try to target civilians and public places. However, these attacks will only strengthen the determination and will of the anti-terror front, the statement said. The KRG also announced that citizens of the Kurdistan Region were among the victims of Istanbul terrorist attack.